In 2014, I made thisbirthday bucket listfor my year. When the following February rolled around, I did, in fact, come online to write updates on how I followed through. However, my blogging was at a standstill, so I never put the post live. Better late than never! It's actually fun to look back on this now, and reminded me that I should probably make a new list for a new year! In fact, a lot of these items are things I can continue to work on -- great refresher. 1. Travel someplace new- Columbus! San Diego! Lake George! Check. My favorite place? The Book Loft! HEY WORLD! For those still subscribed, thanks for sticking around! Am I back? Maybe!! 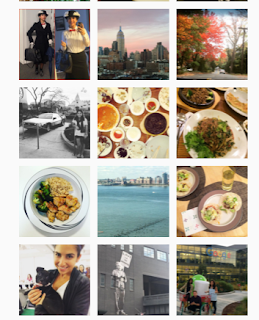 I've been thinking for a while how much I miss having this space to share the things I learn, try, know, and love, and the community that came with the healthy living blogosphere. What inspired me back today? I recently have begun running again after a long haitus, and a friend asked about my mini fanny-pack that so perfectly fits my phone and ID. I told him it was a Spibelt, and for fun went to find the post here where I'd reviewed it, and realized it was still in draft! Never posted! From 2014! What a shame! Then, another friend just this evening asked how my blog is doing - she wasn't sure if she'd been missing out on new posts. Wellll I filled her in, but it was clear: The stars aligned, and it was time to post once (or many more times!) again. Hello, friends! It was four years ago today that I dared to write my first blog post, and so I'm daring to write again. A lot has changed since that first post, and a lot has changed since my last post, too. 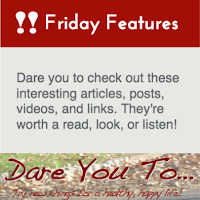 While I haven't been writing, I've still been living the "dare you to" lifestyle, and I dare you to keep it up, too! I'm dropping in quickly, today, just to say HELLO and assure those remaining subscribers that I'm still here! If you haven't already, I dare you to connect with me on Instagram, Twitter, and Facebook to keep up with my latest dares, cooking adventures, fitness endeavors, and other fun activites. I still continue to share updates and content via those channels, and look forward to keeping our wellness discussions going! See you there. Have a great weekend! Happy National Running Day! Did you know that today was the day? Fortunately, here in NYC the rain has stopped but cooled everything down. Perfect for a run! Dare you to hit the road with me. Last year, I celebrated #NationalRunningDay by signing up for my first 10k! That summer, I rocked my running goals and the 10k race. However, it's been an uphill battle since then... After another recent month sans run, I finally hit the road again last week. First, on Memorial Day, I laced up in the morning before it was too hot. I hadn't been running in over a month--and even that was a lot of stop-and-go--I wanted to really kick back into gear! I set my Nike+ app for a full 3.11 miles and told myself that I would run the whole thing. And I did! I kept slow and steady and finished my 5k in about 33 minutes, and since then vowed that I'll get back to covering a 3-mile jog at least once per week for the summer. That's the plan! I used to be a gym rat. I didn't go every day, but I went several times a week and I stuck to my routine. After a summer spent outside, dedicated to my running goal, and a fall spent getting and getting over a respiratory infection.... I fell out my gym habit, hard. My schedule no longer had regular gym days built in, and I lost interest in some of the classes I used to attend religiously. In December, I was finally able to re-instate my healthy habits, and--so far--I'm meeting my January goal of three workouts weekly. For this reason, I thought it's the perfect time to discuss ways that I manage to stick to my gym habit, and how you can, too. 1. Schedule Your Workouts in your Calendar. I figured that, here in NYC, my opportunities for a Napa-like experience would be limited. Sure, there are wine stores that offer tastings (done that! ), but the concrete jungle is otherwise nothing like Napa. 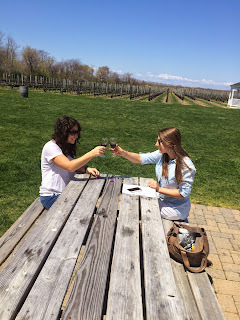 Then, my friend Alyssa signed us up for a "Wine and Music Tour" out in Long Island! It's made just for Manhattanites: a Hampton Luxury Liner charter bus departs from Midtown and drives wine-lovers to three different wineries on the North Fork of Long Island. Alyssa and I always have a great time together, plus we both love wine. The day was topped off by the perfect weather--low 70s and clear skies. Couldn't have asked for anything better! We met up on the corner, chatted our way through the two-hour ride, and stepped out into the sunshine of North Fork. We'd spend an hour each at the first two wineries, and two hours at the last. It's been a wonky week. Amazing weekend last weekend (I'll recap soon) followed by an exhausting exhausting/sickly couple days. I'm zonked! TGIF -- time to catch up on some ZZZs. Want to understand introverts better--for a friend or for yourself? This infographic totally made me go "this is me!" For the why and how of interacting with introverts, click here to learn more. Want to sound smarter in your writing? Skim these 15 Words to Eliminate From Your Vocabulary.